KD24: Best Of My Love | Pool Area KD24: 08/24 NOW DISCOUNTED KD24: Best Of My Love | Front Exterior KD24: Best Of My Love | Dune Deck KD24: Best Of My Love | Pool Area KD24: Best Of My Love | Pool Area KD24: Best Of My Love | Pool Area KD24: Best Of My Love | Cabana KD24: Best Of My Love | Cabana KD24: Best Of My Love | Cabana KD24: Best Of My Love | Cabana Deck KD24: Best Of My Love | Top Level Deck KD24: Best Of My Love | Top Level Deck KD24: Best Of My Love | Top Level Living Area KD24: Best Of My Love | Top Level Living Area KD24: Best Of My Love | Top Level Living Area KD24: Best Of My Love | Top Level Living Area KD24: Best Of My Love | Top Level Living Area KD24: Best Of My Love | Top Level Living Area KD24: Best Of My Love | Top Level Living Area KD24: Best Of My Love | Top Level Dining Area KD24: Best Of My Love | Top Level Dining Area KD24: Best Of My Love | Top Level Dining Area KD24: Best Of My Love | Top Level Kitchen KD24: Best Of My Love | Top Level Kitchen KD: 24 Best Of My Love | Top Level Kitchen KD24: Best Of My Love | Top Level Kitchen KD24: Best Of My Love | Pantry KD24: Best Of My Love | Top Level Loft KD24: Best Of My Love | Top Level Loft KD24: Best Of My Love | Top Level Bedroom 14 KD24: Best Of My Love | Top Level Bedroom 14 KD24: Best Of My Love | Top Level Bedroom 14 KD24: Best Of My Love | Top Level Bedroom 14 | Balcony KD24: Best Of My Love | Top Level Bedroom 13 KD24: Best Of My Love | Top Level Bedroom 13 KD24: Best Of My Love | Top Level Bedroom 13 KD24: Best Of My Love | Mid Level Deck KD24: Best Of My Love | Mid Level Deck KD24: Best Of My Love | Mid Level Deck KD24: Best Of My Love | Mid Level Pub KD24: Best Of My Love | Mid Level Pub KD24: Best Of My Love | Mid Level Pub KD24: Best Of My Love | Mid Level Pub KD24: Best Of My Love | Mid Level Pub KD24: Best Of My Love | Mid Level Pub KD24: Best Of My Love | Mid Level Pub KD24: Best Of My Love | Mid Level Pub KD24: Best Of My Love | Mid Level Theater KD24: Best Of My Love | Mid Level Theater KD24: Best Of My Love | Mid Level Bedroom 12 KD24: Best Of My Love | Mid Level Bedroom 12 KD24: Best Of My Love | Mid Level Bedroom 12 KD24: Best Of My Love | Mid Level Bedroom 11 KD24: Best Of My Love | Mid Level Bedroom 11 KD24: Best Of My Love | Mid Level Bedroom 11 KD24: Best Of My Love | Mid Level Bedroom 10 KD24: Best Of My Love | Mid Level Bedroom 10 KD24: Best Of My Love | Mid Level Bedroom 9 KD24: Best Of My Love | Mid Level Bedroom 9 KD24: Best Of My Love | Bottom Level Bedroom 8 KD24: Best Of My Love | Bottom Level Bedroom 8 KD24: Best Of My Love | Bottom Level Bedroom 8 KD24: Best Of My Love | Bottom Level Bedroom 7 KD24: Best Of My Love | Bottom Level Bedroom 7 KD24: Best Of My Love | Bottom Level Bedroom 6 KD24: Best Of My Love | Bottom Level Bedroom 6 KD24: Best Of My Love | Bottom Level Bedroom 5 KD24: Best Of My Love | Bottom Level Bedroom 5 KD24: Best Of My Love | Bottom Level Bedroom 4 KD24: Best Of My Love | Bottom Level Bedroom 3 KD24: Best Of My Love | Bottom Level Bedroom 3 KD24: Best Of My Love | Bottom Level Bedroom 2 KD24: Best Of My Love | Bottom Level Bedroom 2 KD24: Best Of My Love | Bottom Level Bedroom 2 KD24: Best Of My Love | Bottom Level Bedroom 1 KD24: Best Of My Love | Bottom Level Bedroom 1 KD24: Best Of My Love | Outside Showers KD24: Best Of My Love | Oceanfront KD24: Best Of My Love | Cabana Deck KD24: Best Of My Love | Oceanfront KD24: Best Of My Love | Front Exterior KD24: Best Of My Love | Front Exterior KD24: 07/20-BEACH VALUE PACKAGE, 08/24 - DISCOUNTED KD24: Book 07/20 and Get A Special Package Deal! 'Best of My Love' - Offering 14 generously-sized master bedrooms, and that's just the beginning. The top level boasts a wide open ocean view from the entire great room and kitchen. Two generous seating areas provide space for watching television or enjoying the gas fireplace with brick hearth, while there are four dining tables with seating for forty. The expansive kitchen boasts a six burner gas stove with griddle and exhaust hood, two electric range ovens and two wall ovens. Large stainless steel refrigerator and freezer, plus another fridge and tons of storage and counter space in the butler's pantry. A well-decorated loft provides a nearby retreat with television and queen sleep sofa. Ready for a stroll downtown? Hop in the elevator to the mid-level and you will find the pub and cinema. The theater room has comfy tiered seating for 14 and an elegant old Hollywood decor, with a projector and wide screen to enjoy all your favorites. But the pub truly stands out as something special! Real antiques from authentic Irish pubs are found throughout. All the modern conveniences are here as well, including a full sized refrigerator, ice maker, drawer microwave, blender, coffee maker and plenty of bar ware for your mixing needs. Stained glass panels filter the light to give you that homey pub feel, along with warm wood paneling and upholstered leather arm chairs at the bar and around the poker table. Above the antique glass door from Fibber McGinty's that leads back into the hallway is a sign reading "Slainte". This is a Gaelic word pronounced "slonch-ay" meaning health, and is used as a toast in Ireland. More rec room features include a shuffleboard table, pool table, two large flat screen televisions and a queen sleep sofa. There is also a half bath. Glass doors offer a view of the ocean and pool area, and open onto a large covered deck with picnic table. The private pool area has a free form pool, two hot tubs and a real cabana with a sitting area, full-sized refrigerator, sink, cook top, and stereo. There are also two outside showers, a gas grill, a lighted walkway to the beach, and sun deck on the cabana roof. There are picnic tables and a half bath on the ground level covered deck. 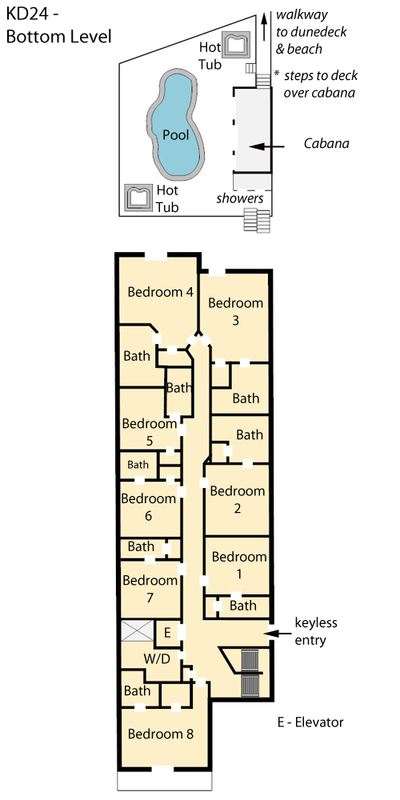 Every bedroom has a private bath, many with convenient walk-in tiled shower and hand-held sprayer. 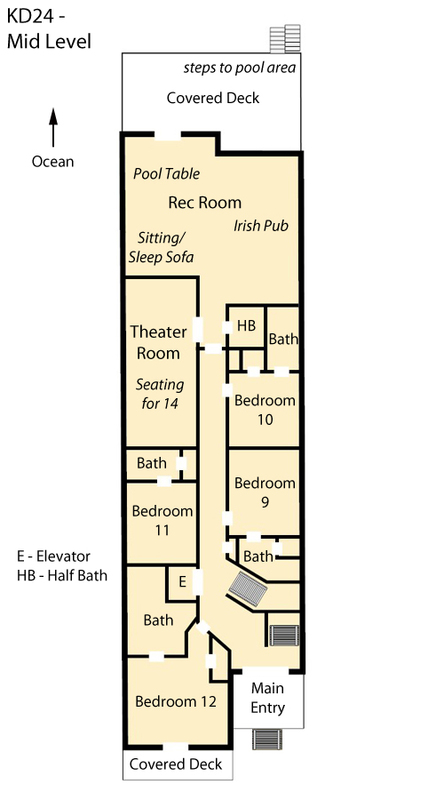 See individual room descriptions on the floor plan tab for more information. 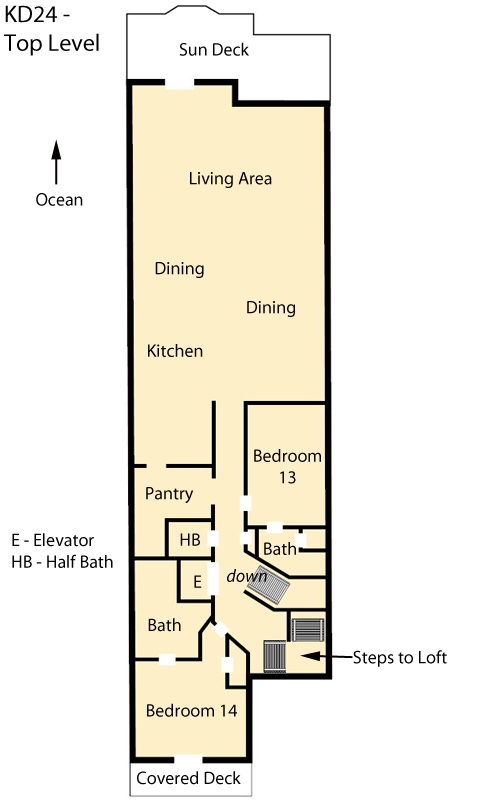 Elevator allows access to all areas of the home except the loft. Non-smoking. No pets. Wonderful house with great amenities! Half our group ended up going to Florida since Hurricane Florence kept us guessing about our scheduled week but it turned out to be a fabulous week!! Amazing place & unforgettable vacation. Plenty of room to accommodate our large group. Small issues (pool heating) were fixed very quickly. Highly recommend this place as well as Village Realty. Thank you for awesome Wedding/ Vacation we had with are friends and some family the house was as great as we had hoped and we would recommend to everyone to stay at Best of my love . Are friends and we said it was the best Vacation we had in a long time THANK YOU SO MUCH!!! The home was very accommodating and clean. First time to stay in a home identical to the pictures!! Your team was amazing. Friendly and C very quick to respond. Best of my Love is a fantastic location for a family union and wedding on the beach. The family could not stop talking on how comfortable the house was and all the extra amenities... we definitely will be coming back..
23 guests and lots of room . This is our 2nd year here . We really enjoy it. The support and service from VR. Is excellent. We had a fabulous vacation! Can't wait to do it again! We have had the best vacation ever! We had 34 family members from up and down the east coast. This house. KD 24, Best of My Love, was better than advertised. Never a problem with too many people any time, day or night. I highly recommend for a large group. We ranged in age from 4 to 68. Love, love this place. Hate to leave!